An interesting base layer that can hold its own in good weather. 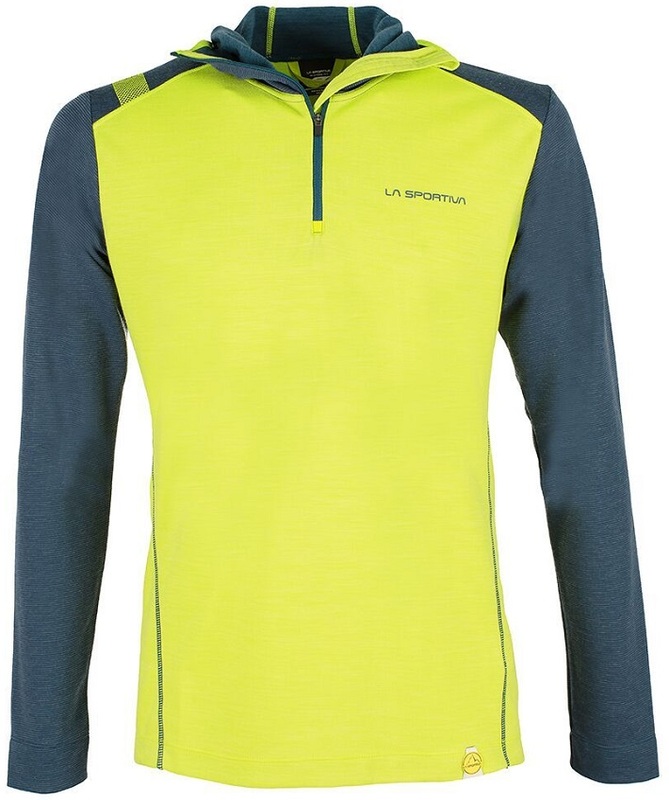 The La Sportiva Stratosphere Hoody is woven with warming blend of EKS fiber and Merino wool yarns, which make a garment optimized for cold weather athletic endeavors. Invented by the Japanese, EKS can absorb moisture and generate heat while you perspire, and the blend with wool further optimizes the temperature regulation. La Sportiva made this hoody one that you can use to layer under a shell, or simply skin uphill in when the temps are appropriate. You can also use the fitted hood and half-zip chest to control heat loss, giving enough flexibility for an average climb. Back at the hut, the Stratosphere Hoody makes a perfect lounging companion. Comfortable flatlock seam technology eliminates chafing on the move. Advanced fiber blend optimizes body climate surprisingly well on its own. Fitted hood can be worn to trap head heat or dropped when the sun hits. Half-zip pullover design gives another option for controlling your temps. Any comparisons between this and Patagonia's R1 or capilene thermal weight hoodie (particularly in regards to weight/warmth)? 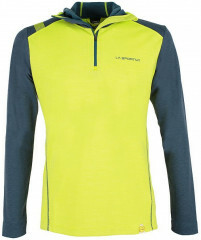 Is it light enough to wear as a baselayer? The Stratosphere Hoodie is more similar in weight to the Capilene, and both are meant to be used as a base layer. The R1 is more of a mid weight piece, and definitely meant to be worn as more of a light mid layer. As an added note, the Stratosphere hoodie is made with merino, and the secret behind this piece is the EKS fabric that absorbs moisture when you're working hard, and expels it away from the body when you're at rest. Pretty cool stuff. I have been touring and training in this all season and think it is a pretty good top for people of average proportions. I am 6'4" and the Large is just right in the chest but a tad short in the sleeve without a long gauntlet glove. The fabric has a slight face to it making it a little wind repellent and it breathes well while definitely warming up under exertion. The hood is a tad loose but warm on cold days. The fabric has a funny smell to it even after a season of washes and long excursions. The color scheme is pretty cool looking so you know you will look good doing whatever you are going to do! I used it skiing with either a tee or long sleeve poly under layer and a wind breaker or puffy outer layer. It works well in a system in temps down in the teens or on its own for 25+ degree ski days or cold snowy runs.